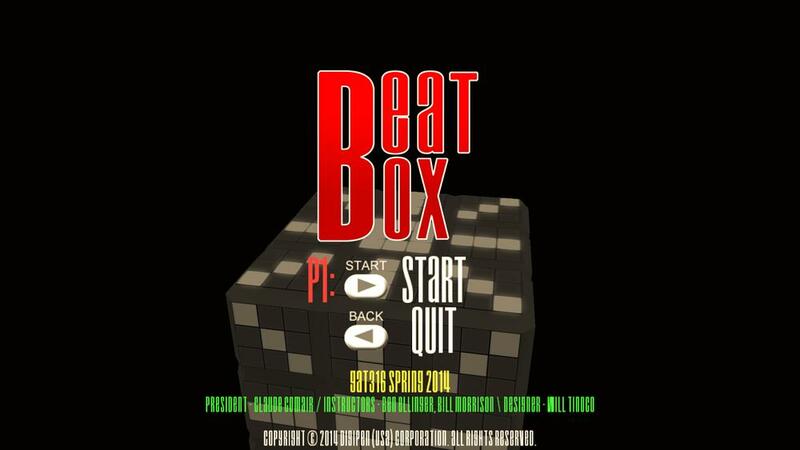 BeatBox is a survival game for 1 to 4 players. Gameplay takes place atop a neon-lit cube which flips and turns in time with a thumping electronic soundtrack which is generated randomly as the game is played. Each flip changes the color of the cube, triggering different enemy types associated with each color to appear and attempt to push the players off. Knocking enemies and other players off of the cube will earn the players points, as will surviving through consecutive flips. The action speeds up as the game goes on, challenging players to keep up. Special events may cause the cube to change shape, gain extra spinning force, or a scattering of power-ups or floating platforms to appear. Players can compete for a high score, aim to be the last one standing, or work together to see how long they can survive as a team.